Alexander James "Ali" Williams (born 30 April 1981) is a New Zealand rugby union player who played at lock, spending almost all of his playing career in his homeland. At provincial level, he played mainly with Auckland, though he spent one season with Tasman and was also loaned out to Nottingham in England's second-level RFU Championship in 2010. At Super Rugby level, he played for both the Blues and Crusaders. Williams played for New Zealand's national team, the All Blacks, between 2002 and 2012. He was in the All Blacks squad for the 2003, 2007 and 2011 World Cups. In 2005, NZ Rugby Almanack chose him as one of its five players of the year. 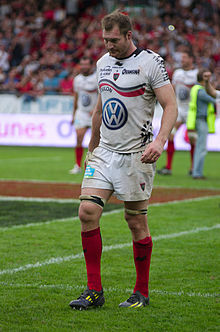 Williams spent what were to have been the final two seasons of his career in France with Toulon, playing there from 2013 to 2015. He came out of retirement to play in the 2016/17 season for top French club Racing 92. On 25 February 2017 Williams was arrested in Paris for allegedly buying cocaine. Williams did not begin playing rugby until 1998 when, aged 17 during his time in Greenbank house at King's college. He played for the King's College Second XV. He had already represented Auckland at junior level in soccer, tennis and cricket. In 1999, he was a member of the King's College First XV and at this stage he decided to concentrate on rugby. Williams attributed much of his early success to 1st XV coach Mark Kennelly. He began a business studies course at Auckland University of Technology, but after playing club rugby and spending time at the Auckland Rugby Academy, he was selected to make his first class debut for Auckland in a National Provincial Championship (NPC) match against Taranaki on 24 August 2001. The following year he was named in the Blues squad for the Super 12 and made his debut against the Hurricanes in the opening game of the season, on 22 February 2002. Later that year, he was selected for the All Blacks' year-end tour to England, France and Wales; he played in all three Test matches, making his international debut against England at Twickenham on 9 November 2002. At the start of the 2004 season, Williams failed to impress new All Blacks coach Graham Henry. Struggling to recover from the foot injury sustained just before the World Cup, he was below his best in the Super 12. Also, Henry was looking for locks who could perform well in the tight forward role, whereas the athletic and mobile Williams was viewed as a forward who was happier operating in loose play. For the trial match between "Probables" and "Possibles", he was chosen merely as a replacement for the "Possibles", and he was left out of the squad to face England, Argentina and the Pacific Islanders, and missed the next five Tests, including the opening match of the 2004 Tri Nations against Australia. He was called into the squad before the Pacific Islands match, as cover for the injured Keith Robinson, but was not used, and he was left out of the squad for the Tri Nations. When Robinson had to withdraw from the opening game, it was Simon Maling, not Williams, who was called up to replace him. Williams was recalled to the squad for the next game, against South Africa, in which he came on as a substitute, and started in the return fixture against Australia, a game which the All Blacks lost and in which Williams was sin-binned after New Zealand were adjudged to have infringed repeatedly. After an indifferent performance against Australia—according to coach Graham Henry, "we thought Ali Williams had an opportunity on Saturday and didn’t take it"—Williams was dropped from the squad for New Zealand's last game in the 2004 Tri Nations, against South Africa, who won comprehensively, out-scoring the All Blacks by five tries to two. Williams retired from rugby at the end of the 2014–15 northern hemisphere season. Several months later, he was hired by the Paris-area club Racing 92. He was to serve primarily as media advisor for fellow All Black Dan Carter, who arrived in Paris to play for Racing after the All Blacks' victory in the 2015 Rugby World Cup. Racing determined that the demands on Carter's time were great enough to justify a special advisor. Rodney Williams, Ali's father, was born in Kent, then moved and played rugby for Blackheath. His mother, Helen, was born in Carlisle, England, and her mother, Doreen, comes from Galashiels, Scotland. Rodney and Helen emigrated to New Zealand after they married, and Williams was born there. By birth, he was qualified to play for New Zealand; through his parents, he was eligible to play for England; and through his maternal grandmother he was eligible to play for Scotland. Through his mother, he is related to Donald Fairgrieve, former president of Gala RFC in the Scottish Borders, and also to former Scottish scrum-half Arthur Dorward (a cousin of his maternal grandfather), who played 15 Tests between 1950 and 1957. His younger brother, Jay, is also a rugby footballer, who played at lock for Auckland and has several caps for the esteemed Kew Occasionals, London's most social club! Together with former Blues and All Blacks teammate Doug Howlett, Williams is an official patron of the KidsCan Charitable Trust, a national charity dedicated to the welfare of financially disadvantaged New Zealand children. In 2010, Williams spoke in a radio advertisement for his bottled water company, making claims about the health benefits of drinking more water. A complaint to the Advertising Standards Authority New Zealand was settled without being submitted to the full ASA Board, because the advertisement had been discontinued. In February 2017 Williams was arrested in Paris, caught allegedly trying to buy cocaine outside a nightclub. He was with former Wallabies star James O'Connor, who was also arrested. In April 2017, following an investigation of Williams and O'Connor's conduct, Williams was fined and dismissed from Racing 92. ^ "Rugby players held in Paris drugs raid". 25 February 2017 – via www.bbc.co.uk. ^ "Media Release". AUT. 4 November 2002. Archived from the original on 23 May 2010. Retrieved 5 January 2008. ^ Kitson, Rob (13 June 2003). "Williams relishes second rumble with leader of the pack". The Guardian. Retrieved 7 January 2008. ^ Hewett, Chris (15 June 2003). "The triumph beyond belief". Independent on Sunday. Archived from the original on 20 April 2013. Retrieved 6 January 2008. ^ "All Blacks survive Wales scare". BBC Sport. 2 November 2003. Retrieved 6 January 2008. ^ Ingle, Sean (2 November 2003). "New Zealand 53 – 37 Wales". Guardian Unlimited. Retrieved 7 January 2008. ^ "The tournament that promised a miracle". Guardian Unlimited. 25 November 2003. Retrieved 7 January 2008. ^ "I'm a lock, Williams declares". allblacks.com. 3 December 2004. Archived from the original on 11 October 2007. Retrieved 6 January 2008. ^ "All Blacks trial teams". allblacks.com. 24 May 2004. Archived from the original on 22 October 2008. Retrieved 6 January 2008. ^ Hewett, Chris (4 June 2004). "Henry quick to stamp his authority on All Blacks". Independent on Sunday. Archived from the original on 20 April 2013. Retrieved 6 January 2008. ^ "Replacements called into All Blacks squad". allblacks.com. 6 July 2004. Archived from the original on 22 October 2008. Retrieved 6 January 2008. ^ "Robinson joins list of doubtful". allblacks.com. 15 July 2004. Archived from the original on 18 October 2008. Retrieved 6 January 2008. ^ "Williams back with new attitude". allblacks.com. 4 August 2004. Archived from the original on 11 October 2007. Retrieved 6 January 2008. ^ Bills, Peter (8 August 2004). "Smith masters the Black arts". Independent on Sunday. Archived from the original on 20 April 2013. Retrieved 6 January 2008. ^ "Mehrts: the comeback is complete". allblacks.com. 11 August 2004. Archived from the original on 18 October 2008. Retrieved 6 January 2008. ^ "Williams, Tuitupou and Gibson suspended". allblacks.com. 22 March 2005. Archived from the original on 21 October 2008. Retrieved 6 January 2008. ^ Hewett, Chris (11 June 2005). "Sivivatu signals All Blacks' ruthless intent". Independent on Sunday. Archived from the original on 20 April 2013. Retrieved 6 January 2008. ^ "All Blacks Twin Towers lead the way". allblacks.com. 26 June 2005. Archived from the original on 21 October 2008. Retrieved 6 January 2008. ^ Hewett, Chris (26 June 2005). "The day tourists were skinned by an Ali cat". Independent on Sunday. Archived from the original on 20 April 2013. Retrieved 6 January 2008. ^ "New Zealand 38–19 Lions". BBC Sport. 9 July 2005. Retrieved 6 January 2008. ^ "McAlister out and Somerville in serious doubt". allblacks.com. 25 October 2005. Archived from the original on 11 October 2007. Retrieved 7 January 2008. ^ "Two new caps to play Ireland". allblacks.com. 9 November 2005. Archived from the original on 13 October 2007. Retrieved 7 January 2008. ^ "All Blacks squad for Ireland and starting XV for Argentina announced". allblacks.com. 28 May 2006. Archived from the original on 30 September 2007. Retrieved 7 January 2008. ^ "Injured Williams in doubt for Irish test". allblacks.com. 30 May 2006. Archived from the original on 11 October 2007. Retrieved 7 January 2008. ^ "Jack Replaces Williams in Squad to play Ireland". allblacks.com. 5 June 2006. Archived from the original on 11 October 2007. Retrieved 7 January 2008. ^ "Williams set for return". allblacks.com. 24 June 2006. Archived from the original on 3 November 2007. Retrieved 7 January 2008. ^ "408th All Black Test". allblacks.com. Retrieved 7 January 2008. ^ "Ten changes to second Test team". allblacks.com. 8 November 2006. Archived from the original on 21 October 2008. Retrieved 7 January 2008. ^ Rees, Paul (27 November 2006). "Total pressure takes All Blacks a world away from Wales". The Guardian. Retrieved 7 January 2008. ^ "Ali wants your winning recipe". Rugby Heaven. 18 June 2007. Archived from the original on 16 October 2007. Retrieved 5 January 2008. ^ "Robinson ruled out of Italy match". allblacks.com. 3 September 2007. Archived from the original on 12 October 2007. Retrieved 8 January 2008. ^ "Emotional day for Ali". allblacks.com. 24 September 2007. Archived from the original on 12 October 2007. Retrieved 8 January 2008. ^ Donaldson, Scott (20 May 2007). "Graham Henry's conditioning seems to be working". Sportingo. Archived from the original on 14 January 2008. Retrieved 8 January 2008. ^ "All Blacks lock Ali Williams sent home for misbehaviour". Associated Press. 7 May 2007. Retrieved 5 January 2008. ^ "Ali Williams: 'It takes two to tango...'". NZ Herald. 9 May 2007. Retrieved 5 January 2008. ^ "Ali Williams signs up for two more years". sportal.co.nz. 24 August 2007. Archived from the original on 31 January 2008. Retrieved 5 January 2008. ^ "Tasman was Ali's only option". Sunday News. 26 August 2007. Retrieved 5 January 2008. ^ "2008 Rebel Sport Super 14 squads announced". allblacks.com. 31 October 2007. Archived from the original on 10 December 2007. Retrieved 5 January 2008. ^ "Ex-All Black Ali Williams appointed as Dan Carter's media advisor". ESPN (UK). 8 December 2015. Retrieved 9 December 2015. ^ "Ali's Border connection". Border Telegraph. 29 November 2005. Archived from the original on 8 July 2011. Retrieved 5 January 2008. ^ "Williams has special reason to be proud at Murrayfield". The Scotsman. 20 September 2007. Retrieved 5 January 2008. ^ "Arthur Dorward". scrum.com. Retrieved 5 January 2008. ^ "KidsCan". Retrieved 5 January 2008. ^ "New Zealand Advertising Standards Authority". old.asa.co.nz. ^ "Ali Williams announces baby girl". 3 News NZ. 3 April 2013. ^ "Ali Williams arrested in Paris, allegedly tried to buy cocaine". Newshub. 26 February 2017. Retrieved 25 February 2017. ^ "Ali Williams hit with another fine, axed by Racing 92". 20 April 2017 – via www.nzherald.co.nz. "Video: Ali Williams happy to be in the team". nzherald.co.nz. 4 July 2008. Retrieved 4 July 2008. This page was last edited on 7 February 2019, at 04:36 (UTC).